July 7th saw Mike start his holidays and pick up the new rental car – European full-sized. We packed up the apartment, handed over the keys (nooooooo), packed the car full to the brim, and programmed the tomtom for DISNEYLAND! 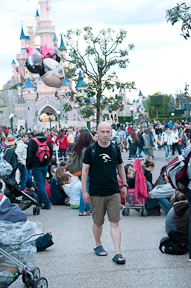 Yes we were going to Disneyland Paris for 2 nights/3 days and the kiddies were going to lose their minds – or maybe we were the ones loosing our minds! We made our way to the hotel, checked in, unpacked the car, and within 15 minutes, without even leaving the hotel Syd had a new best friend (Tinkerbell aka Tink) to carry around….. you know what….. it was going to be a long 3 days of saying NO…….. constantly! The weather was mixed. We drove through the Paris rain, but the clouds parted and the sun came beaming through just as we entered Disney Village for lunch. Our lunch spot was one I never thought I would EVER take my kids too….. The Rainforest Cafe! Now, the trip really hasn’t been the culinary journey I hoped it would be for the kiddies – although they had never been to Rainforest Cafe before……. and absolutely LOVED it. I mean really how could they not. With animated elephants, gorillas and butterflies, all topped off with an indoor thunderstorm – seriously if you are 5 and 3, and they serve a monster portion of french fries…… this is THE BEST RESTAURANT…….. EVER! After lunch we made our way to the park entrance, where Brodie and Sydney went on a hunt to see who could find Tinkerbell (our new best friend) first. It was a tie – as usual. The park was jammed full of people, with lineups in every direction, for absolutely everything. With many ooohhhhss, and awwweess, we made our way to Sleeping Beauties Castle. The kiddies were super excited to be inside the castle, although Sydney was concerned that she couldn’t find Mickey or Minnie – “because that’s where they live”. After our inspection of the castle was complete, we made our way into the rest of the park. 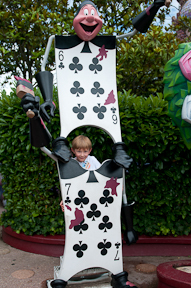 With line ups of 90 minutes or more, for almost all the rides, we decided to do the Alice in Wonderland maze since the lineup was moving fast. 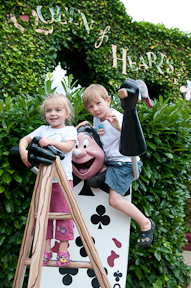 The kiddies loved the jumping water, the playing card guards and the spinning eyes on the hill. Once we finished up the maze adventure, we decided to go to the room and get ourselves organized for the night and the parade that would be taking place that evening. Passing by Sleeping Beauties castle we noticed that we missed checking out the dragons home. We ventured in for a look, and I was surprised by Brodies reaction….. he was genuinely scared of the dragon! I find this a bit funny since the boy has been watching Starwars for the past couple of years and NOTHING, and I mean NOTHING……. about ANYTHING……… seems to scare him. Well this dragon did…… he didn’t know if it was real or not! 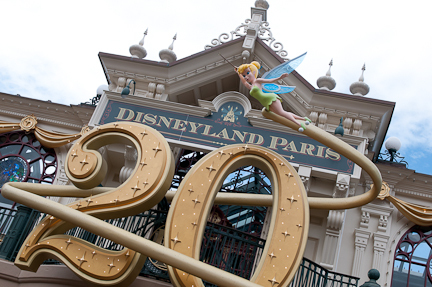 Disneyland Paris is celebrating it`s 20th anniversary…… AND so was our hotel room. The room was clean but definitely in need of some modern updates. A TV (from this millennium) with a HDMI hookup would have been nice, as well as Wi-Fi for my computer and iPhone (……seriously – no WiFi??). We made our way to the Mickey Cafe to have dinner (another restaurant on the amazing culinary tour for us). It really was awesome for the kiddies since all the characters walk around and visit your table while you eat dinner. They will sign your autograph book ( that is IF you remember to bring it), and sit for pictures. Syd was pretty shy around the characters and wouldn`t even touch or look at them, but Brodie was “all in” on this one! We made our way into the park for the nightly light/water show. It was quite a wait, but it was pretty awesome. The kids loved the lit up floats with all the characters, and the water and projection show on Sleeping Beauties Castle was spectacular. The only problem was the duration! We waited till almost dark for the floats and then we waited another 30 minutes after the parade for the projection show. I didn’t time the whole production, but, when you have little ones with you, it really started to feel LONG! We couldn’t have left even if we wanted to, because we were packed tight like sardines, with a ton of other people and their little kids. The show was totally amazing, and the rain held off ….. quite literally till the show ended. We walked back to the hotel in the pouring rain and arrived at 12:15 AM. It was a long day! We slept late, and had breakfast at the hotel – more characters showed up for photo opportunities, so not all was lost by sleeping late. 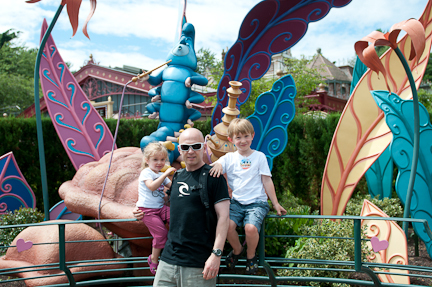 Mike and I decided to divide and conquer with the kiddies heading into the park since their interests were different. Mike and Brodie would head over to Space Mountain/Buzz Lightyear/Star tours, and Syd and I would head over to the Dumbo the Elephant ride/Castle/Tea cups. We would meet up just outside the Peter Pan ride for lunch and go from there. Syd and I got to the Flying Elephant ride to about an hour wait in line. A few of the thoughts running through my mind were “seriously”, “wish I had packed something for Syd to eat”, “wish I had packed some water”, ” I wonder how long the ride actually is?”. Well I decided to time the ride…. 1 min 20 sec……. exactly! This was NOT a good return on our investment in line! Well after about 20 minutes Syd saw the popcorn stand below the ride. 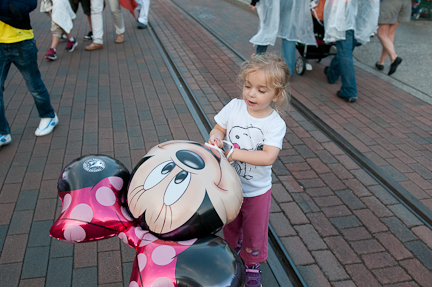 This was enough for her to make the conscious decision to leave the lineup for popcorn, knowing we would NOT be coming back and lining up for the Dumbo Ride. The 9.00 euro popcorn was also a DUD. Not only did I pay 9.00 euro for popcorn (seriously…… its popcorn Disney, not Mickey shaped popcorn sprinkled with gold dust), but all the popcorn in Disneyland Paris is “sweet popcorn”. BARF. Well Syd took one bite and also decided it wasn’t for her. Now what to do with popcorn I just spent about $13.00 Canadian dollars on?!? I took it back to the same stand. The woman there spoke really great english till she realized I wanted my money back…. she even at one point totally ignored me. It really wasn’t that long time before I got my 9.00 euro back (I think she realized I wasn’t going to leave till I got my cash back) and she got her sweet popcorn back! 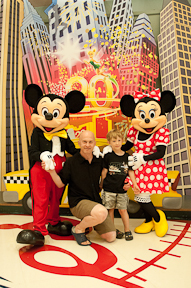 We hooked up with Mike and Brodie after their adventure – Mike waited in what seemed like the “slowest lineup ever” for food (if McDonalds can do it in a blink of an eye…… Disney …. so can you!). At this point I decided I needed a coffee and the kiddies needed a nap. We headed back to Disney Village, grabbed a coffee while both kiddies napped in the stroller. We called it an early night after another FANTASTIC meal at the Rainforest Cafe! Our last day in Disneyland, and we slept late again. On our way to breakfast we had pictures with Pluto, and then Mickey and Minnie both showed up. Syd decided she now was in love with Minnie and just couldn’t get enough of her. Sydney herself, must have had 5 separate photos of her and the mice. 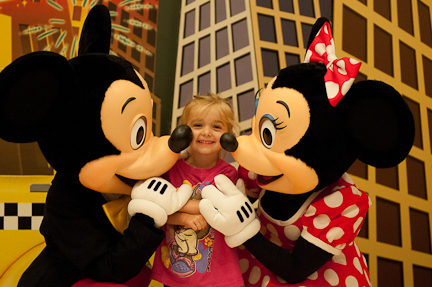 In the last photo she was being kissed by both Mickey and Minnie and she was sooooooo happy! We spent most of the day in the Space Mountain/Star Tours area. We had some FAST PASS tickets for rides which meant we really didn’t have time to leave the area. 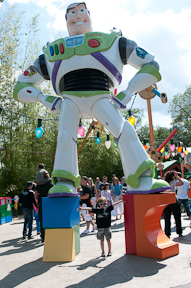 We had lunch and then all hopped on the Buzz Lightyear ride for some “ray gun” fun! We decided to call it a day in the Disney Park since Mike had a conference call and Syd needed a big nap in the stroller. 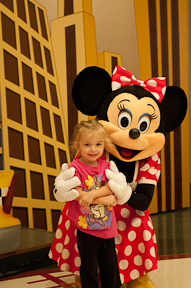 I headed to Walt Disney Studios for the rest of the afternoon with the kiddies – one sleeping and one awake! 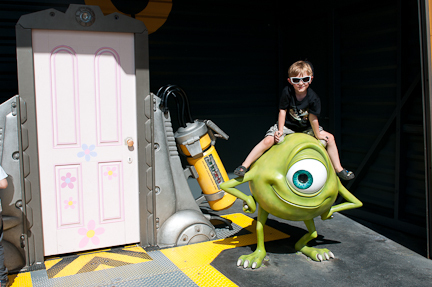 Brodie and I didn’t really go on any rides but hung out looking at all the Pixar displays and rides. Brodie and I went for a “coffee“ and watched Le Tour de France on the big screen all while the little Miss slept. By the time we hooked back up with Mike, he had our little “European full sized“ car packed and ready for the short drive to Orleans, where we would spend the night before we headed out on our monster drive to Carcassonne! 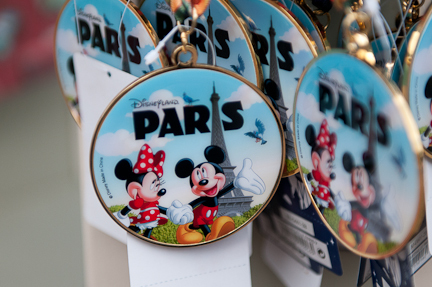 I dont really think we had a true “DISNEY“ experience in Paris. I told Mike that we needed to head to California at some point with the kiddies. 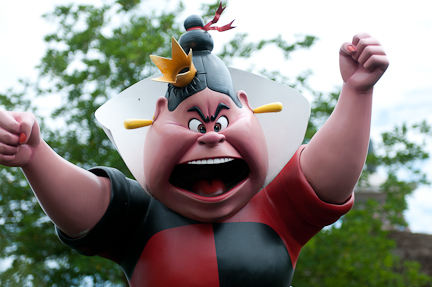 He reply……“ the kiddes had fun, know no different and that one Disney Experience is enough“ . Mr. Logical! 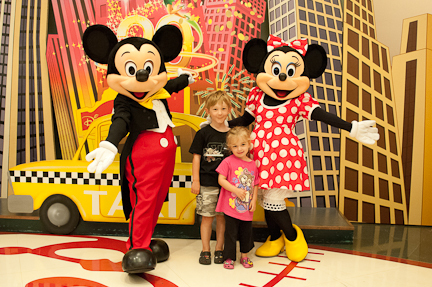 Look out Disney Aneheim….. we will be coming your way with the kiddies….. someday! NO NO NO…. for the bazillionth time you CAN NOT have cotton candy! 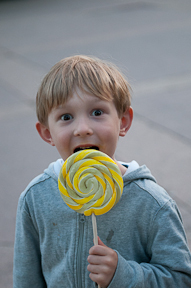 “`thanks for buying me my lollipop after I cried in the store Daddy“ because I DESERVE this for throwing a 45 minute tantrum in the middle of Disney…. 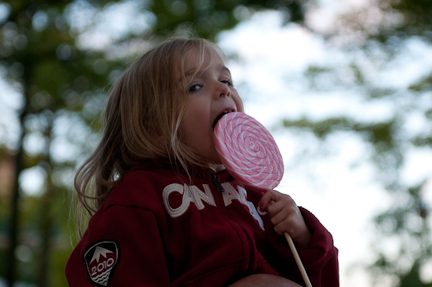 the calories that you burn throwing yourself on the ground and screaming NEED to be replaced with PINK SWIRLY sugar! 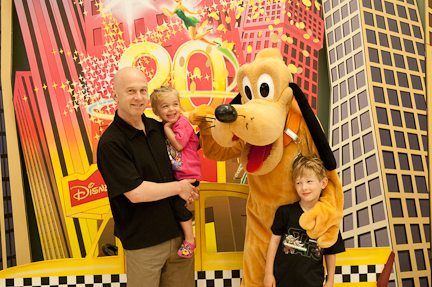 Can you guess who let Minnie fly free…..
Pluto……the hair messing, tickling dog! 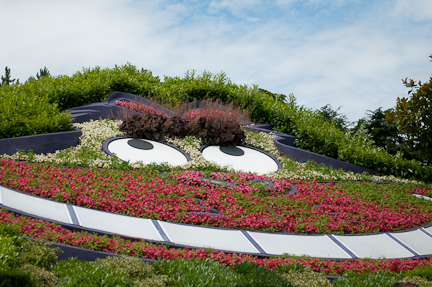 This entry was posted in Our Adventure and tagged Carcassonne, Disneyland, Disneyland Paris, France, Mickey Mouse, Minnie Mouse, Orleans, Paris, travel, travel with kids by dailydoseofeurope. Bookmark the permalink. Fabulous blog Barb and seriously entertaining! I love your blog Barb…I’m having a great time reading about your family adventures! 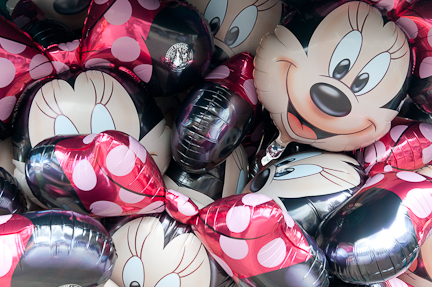 Love the photos with Mickey & Minnie!